WILLCOX, Ariz.— Ask Sam Lindsey about the importance of Northern Cochise Community Hospital and he’ll give you a wry grin. You might as well be asking the 77-year-old city councilman to choose between playing pickup basketball—as he still does most Fridays—and being planted six feet under the Arizona dust. Lindsey believes he’s above ground, and still playing point guard down at the Mormon church, because of Northern Cochise. Last Christmas, he suffered a severe stroke in his home. He survived, he said, because his wife, Zenita, got him to the hospital within minutes. If it hadn’t been there, she would have had to drive him 85 miles to Tucson Medical Center. Several months ago, Northern Cochise sought to strengthen its chances for survival by joining an alliance with Tucson Medical Center and three other rural hospitals in southwestern Arizona. Together, the Southern Arizona Hospital Alliance is negotiating better prices on supplies and services. And the Tucson hospital has promised to help its rural partners with medical training, information technology and doctor recruitment. Northern Cochise and the other rural hospitals in the alliance, which is similar to ones in Kansas, Mississippi, Washington state and Wisconsin, hope that by joining they will avoid the fate of 56 rural hospitals that have closed since 2010. Another 283 rural hospitals are in danger of closing, according to the National Rural Health Association (NRHA). Right now, some Arizonans in the region are learning what it’s like to lose a hospital. Cochise Regional Hospital, in Douglas, near the Mexican border, closed earlier this month, following Medicare’s decision to terminate payments because of repeated violations of federal health and safety rules. The hospital was part of a Chicago-based chain and its closing leaves Arizona residents in the far southeastern portion of the state up to 75 miles away from the closest hospital emergency room. Sam Lindsey shudders to think what a long drive to Tucson would have meant for him last Christmas. The alliance offers the rural members multiple advantages. One of the most important is in purchasing. Their combined size will enable them to get discounts that are beyond them now. For example, instead of being a lone, 49-bed hospital with limited bargaining leverage, alliance member Mount Graham Regional Medical Center, in Safford, is suddenly part of a purchasing entity with more than 700 beds. Bryce said that he expects the added purchasing power alone will save Mount Graham “in the six figures” every year. Similarly, the hospitals expect the combined size of the alliance to result in lower costs for employee benefits, workers’ compensation and medical malpractice insurance. The alliance also helps the rural hospitals recruit doctors and other medical providers, many of whom are reluctant to work, let alone live, in isolated areas. Rural hospitals rarely have the contacts and relationships that help urban hospitals find doctors. “We’ve been trying to recruit another primary care doctor to this community for the last year with no success,” said Rich Polheber, CEO of Benson Hospital, another alliance member. Tucson Medical Center has pledged to use its own recruiting muscle to help its rural partners find providers who are willing to live in rural areas, or at least regularly see patients there. As an incentive, Tucson will offer interested doctors help in managing the business aspects of their practices. The rural alliance members also want Tucson’s help with medical training and IT. Some have dipped into telemedicine, which is particularly valuable for rural hospitals underserved by specialists, and are looking to expand those efforts. Copper Queen Community Hospital, in Bisbee, the fourth rural member of the alliance and probably the rural hospital in the best financial shape, is the most advanced user of telemedicine. Its networks in cardiology, neurology, pulmonology and radiology can connect doctors and their patients to specialists at major institutions such as the Mayo Clinic and St. Luke’s Medical Center, in Phoenix. The alliance also will make it easier for patients who have surgery in Tucson to be transferred back to their home hospitals for recovery and rehabilitation, saving them and their families from traveling long distances. Despite the numerous advantages for the rural partners, the idea for the alliance began with the Tucson hospital, which approached the others with the proposal last spring. 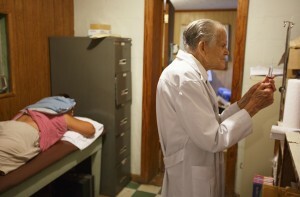 At the outset, some of the rural hospitals were skeptical. “At first, we were like, ‘OK, so why are they doing this? What’s in it for them? Do they want to absorb us?’ ” said Bryce, the Mount Graham CFO. But after a series of meetings, the suspicions disappeared and the rural hospitals eagerly signed on. The Tucson hospital was frank about its motivation: to remain independent in an industry moving toward consolidation. As a result of acquisitions in the last few years, it is the last locally owned, independent hospital in Tucson. “All of a sudden, we were in a situation where [Tucson Medical Center] found itself isolated and facing its own competitive market pressures because the environment had so dramatically changed,” said Susan Willis, executive director of market development at the hospital and president of the new alliance. Nearly a quarter of Tucson’s patients come from outside the city, many from the areas served by the rural hospitals in the new alliance. Cementing the relationship with those hospitals, Willis said, will help Tucson maintain a flow of patients who need medical services that are beyond the capabilities of the rural hospitals. The rural members have laboratories, diagnostic equipment and therapeutic services, but some have little or no surgical or obstetrical services. Not one is equipped to perform complicated surgeries. “Certainly you could describe it as a defensive strategy,” Willis said. Many of the problems plaguing rural hospitals date to 1983, when Medicare began paying hospitals a set fee for medical services and procedures rather than reimbursing them for the actual costs of providing that care. From 1983 to 1998, 440 rural hospitals closed in the U.S., according to the NRHA. That prompted Medicare to begin reimbursing certain rural hospitals for their actual costs, which helped stabilize them. But the recession hit rural hospitals especially hard, as did 2011 budget cuts that reduced Medicare payments by 2 percent. Because the rural population tends to be older, rural hospitals rely heavily on Medicare payments. The pressure increased in 2012, when the federal government reduced by 30 to 35 percent its reimbursements to hospitals for Medicare patients who don’t cover their share of the bill. “That’s an example of how a little policy change that seems insignificant in Washington can have profound effects in the rural areas,” said Brock Slabach, NHRA’s senior vice president for member services. Given the threats to the nation’s rural hospitals, many are eager to learn from any models that work, which is why the Arizona alliance has attracted notice. The rural members of the alliance are major employers in their communities and assets in attracting other employers and residents, including the snowbirds, who flock to the area every winter. But hospital leaders, workers and patients say saving lives is the main reason the hospitals must remain open. This copyrighted story comes from Stateline, the daily news service of the Pew Charitable Trusts.